To save the orca, make salmon runs healthy again. 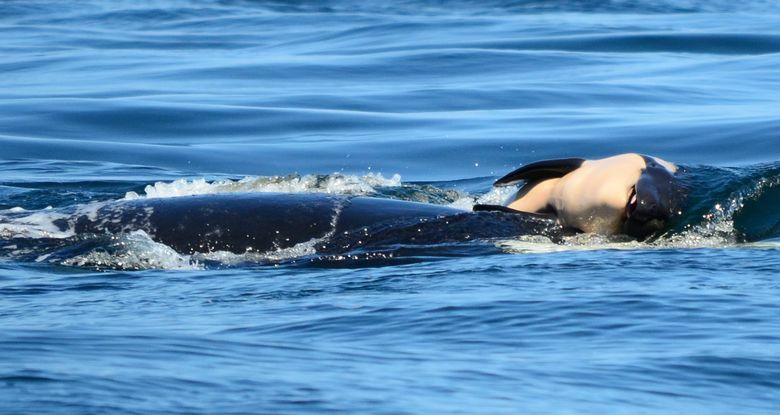 The grieving orca mother that carried her calf for 17 days caught the public’s attention last month. The southern resident orcas of the Salish Sea are drifting toward extinction. Their population has dwindled to just 75 individuals. Every calf that has been born in the last three years has died before it could reach maturity. Some of the factors leading to the orca extinction are tied to the human activities in the region — toxic pollution, commercial vessel traffic and the noise those vessels produce. But the story of the orca demise is a much bigger one. It starts hundreds of miles up the Columbia River, where dams block salmon from the river’s upper reaches. These dams, constructed to harness the river, cut off salmon from thousands of miles of habitat. The Columbia River once produced the largest salmon runs on Earth, often exceeding 10 million salmon per year. Today, only a fraction return to spawn in an enormous unused habitat. Salmon are a keystone species of the ecosystem. They are an essential food source for many animals, including bears, otters, eagles and orca. Because salmon migrate up rivers from the ocean, they carry important nutrients from the marine to the terrestrial ecosystems. Their bodies don’t just feed animals but provide nourishment for forests as well. In fact, their health is a strong indication of environmental quality. When their numbers decline, it is an alert that other species, including humans, are at higher risk of pollution and other unhealthy conditions. The decline of salmon is bad for humans. And it’s bad for orcas as well. The southern resident orca diet is heavily dependent on salmon from the Fraser and Columbia Rivers — primarily chinook salmon. You want to save our orca? Save our salmon. Our collective action can save these iconic species. An opportunity right in front of us is changing how we manage the Columbia River watershed. The Columbia River Treaty is the 1964 agreement between the United States and Canada that provides joint management of the river system. In May, the U.S. and Canadian officials began renegotiating the treaty. These negotiations could change our region for generations to come. Though Tribes and First Nations face unfounded exclusion from the negotiating table, we still continue to fight and advocate that ecosystem health be included as the third primary purpose for how we manage the river. Until now, the only two factors have been flood control and power generation. We must move beyond this antiquated behavior. How do we manage the Columbia River for ecosystem health? For one thing, we must look at solutions to restore passage for salmon so they can reach the Upper Columbia River, which will be essential as the climate changes and temperatures warm. Salmon will need to reach higher elevations and cooler waters in order to survive. It also means we operate dams for healthier river flows and water quality to help the struggling fish and wildlife that depend on our rivers. We believe practical solutions can be found within current operations to still meet the energy needs of our communities. Changing how we manage the Columbia River is complicated, but ecosystems are complicated. They are made up of a complex, interconnected network of living things interacting with each other and with their environment. As tribal members whose ancestors have lived in and cared for these waters for thousands of years, we know that everything is interconnected. You can’t slice and dice what parts of the ecosystem you will save. You can’t save the orca without saving the salmon. And you can’t save salmon without protecting and restoring the rivers. The time to act is now. In the Upper Columbia, we used to see millions of salmon return each year. They swam up the Columbia River and then up the Spokane River to the Spokane Falls. We haven’t seen salmon here in more than 75 years, not since Grand Coulee Dam was built without fish passage. Let’s create a different future for our salmon and the southern resident orca. We want to tell our children and grandchildren that we came together when the orca and salmon needed it the most. D.R. Michel is executive director of the Upper Columbia United Tribes.